My big plans for today – to share with you a whole completed stack of red Christmas napkins embroidered with snowflakes using the patterns I’ve been posting on Needle ‘n Thread lately – have fizzled to naught! Unless I sprout another eight arms and acquire another eight hours in the day, they won’t, alas, be finished. So I’ve decided to do what any sane person would do, and let it go. There’s always next year! As I mentioned the other day, I’ll be taking my First Ever Long Break from Needle ‘n Thread this holiday season. I’ll be officially “on vacation” beginning tomorrow through January 4th. I’ll still check in on the website to moderate comments and to answer email when I can, though, so I’m not abandoning you altogether. I just won’t be posting any new articles until January 4th. And in the background, I’ll be working on a few projects and tweaking my publishing and project schedule for 2016. I’m drumming up a lot of new embroidery-related content for the upcoming year, and I’ve got a few surprises up my sleeve for you, too – not the least of which is the launch of the new Needle ‘n Thread, which will happen early in 2016. I’ll warn you first! For those who have asked for a personal update, I’ve written you this short Christmas letter. If you want to read it, feel free. If you don’t – that’s fine, too! I hope that, wherever you are, whatever you’re doing, you’re happy, healthy, and surrounded by those you love. May your Christmas be filled with joy and all kinds of good things, and may 2016 bring you an abundance of blessings! Christmas blessings on you, Mary. We’re all thinking of you. Bon noël à vous également que la paix soit avec vous et les vôtres. Essayez de vous reposer et gardez vous en bonne santé. Thanks for the update. Glad to know you are doing well considering what you are dealing with. May your Christmas and New Year be blessed. Thank you for sharing your personal story with us! Your positive outlook is so inspiring. I am thinking of and praying for you, for a full and complete recovery. Best wishes to you and yours this Christmas season, and many, many blessings in the New Year! Sometimes our best plans are derailed and it’s good that we can just learn to go with the flow. Your napkins can wait – they’ll be just as beautiful when you do get them done. Thank you for the update – take good care of you, one day at a time. A very blessed Christmas Mary – to you, and to those you love. Wishing you a VERY MERRY CHRISTMAS !!! and may 2016 bring you nothing but wonderful things! Merry Christmas to you Miss Mary! My wish for you is a happy, healthy Christmas and New Year! ‘Try’ to enjoy your time off and do some things for YOU! Oh, I’m quite certain that the napkins will make an appearance around here one of these days, Mary; no worries! Thank you for the update on your health. I really am glad that you’re taking time to care for yourself and rest. I’m also really glad that your sense of humor hasn’t waned! Have a lovely Christmas and a good vacation. A VERY MERRY CHRISTMAS TO YOU!!!! Thinking of you and sending many good thoughts your way. Here’s to a great 2016! Everyone deserves a break Mary. Enjoy being with your family and leave Needlenthread to itself for a while. Well still be here on January 4. WIshing you a merry Christmas and a better 2016. Merry Christmas, Mary, to you and all your family! Thank you for sharing your experience on your current health journey, which I’m praying is only a detour from which you will soon return to full good health. Your honesty and courage is uplifting and strengthening to me, and, I’m sure, to many others. Since discovering your site and signing up a year or so ago, I’ve enjoyed all your letters (emails!). Reading them is like sitting down with a good friend for tea and a chat. Thank you for them and for your hard work all year. Your website is my top “go-to” resource for stitching, and also for finding a bit of good company if a day gets too long. It’s good to hear you’ll let yourself take a break over the next week. Please let yourself do so whenever you need, knowing you are supported in letting yourself focus on taking care of your health and your needs for not only rest, but also for recreation, when you feel up to it! May you have a warm and happy holiday, and a wonderful New Year! And a happy, healthy 2016. Thank you for this wonderful website that is so enjoyable to read and packed with useful information. Bless you Mary. You’ve given so much of yourself to your readers these past years, I wish there was a way for us to give back to you. I’ve traveled the chemo road in the past – it use to amaze me to see the ‘cocktails’ in the chemo room. There could be 50 people in there being treated and no 2 people getting the same thing. Just keep putting one foot in front of the other and look forward. It’s a difficult journey, but you can and will weather it. Keep your good attitude. My wish for you is a chocolate-filled Merry Christmas…and a happy restful vacation. And I wish you would count me as part of your extended world-wide family…and all of us are sending you lots of prayers for a healthier New Year! Your Christmas Eve Letter was a most welcome note for us. Thank you for sharing your experience and letting us know how you are. We hope all goes well and that this trying period will pass quickly. No need to personally acknowledge this email; just know that prayers and cheers are coming your way. MERRY CHRISTMAS, Mary, and a Very Happy New Year! Enjoy your vacation. Thank you for all the wonderful articles and projects you so generously share. I’m looking forward to all the goodies you’ll have for us in 2016. Dear Mary – many blessings to you for a happy, joyful, peaceful and very Merry Christmas. Please enjoy your little break from this site (although it doesn’t really sound like you’re taking a real break) and please take good care of yourself, too. You’re right, there’s always next year for the napkins. I hope your treatments get easier to deal with and are totally effective. Wishing you a happy, productive, and especially a healthy new year. Thanks for running this wonderful site. Merry Christmas,Happiness.See you for 2016. Kisses and Love from France. Enjoy your First Ever Long Break! If anyone deserves one, it is you. Thank you for the update; I’m grateful to know how you’re doing. Sending you every best wish for the new year. May the Lord bless you with health! Hi Mary, thank you for sharing how you are doing. At least you have passed the first hurdle and now you know what is too be expected. You are so brave because I know this is not an easy thing to go through. Besides your family and immediate friends you have all your friends here at Needle’nTread and on Facebook thinking and praying for you for a complete recovery. Thank you so much for your Christmas letter, I am glad the treatment was good at first! I am on chemo too, but take each day as it comes. I have made many of your projects during the last year, the joy of embroidery gives me peace and serenity and helps to calm. I know of art therapy, but embroidery therapy is better! We are blessed to have the support of our families and friends, and I wish you a very Happy Christmas and New Year. Mary, thank you for the beautiful personal update. You are so much in our thoughts and prayers. And your joyful optimism in the face of challenges is such a bright light to us all. Keep on keeping on, dear Mary. Love you, and Merry Christmas! A very Merry and Blessed Christmas to you Mary! Glad to hear your first round of chemo went well and you are still able to do SOME (emphasize on some) of what you love and enjoy. Pace yourself, save your energy, we are all here to support you and cheer you along this road. Your blog is one of the best online, I often have it on while learning new stitches ( the videos are the best!) – so there is plenty to keep a lot of us occupied even without new posts. P.S. thought you lived in Topeka! Happy Christmas to you and your family. The good bits of the new year will feel all the better for you, because you really do know the difference (I know as well. I’ve walked that road too). The bad bits are there to let your family and friends show you how much they love you. Merry Christmas, my friend. (I do feel we’re friends even though we’ve never met in person.) Have yourself a well deserved rest. I can’t wait to see what fun stuff the New Year will bring. I love your attitude on the unfinished projects and the chemo. The projects will get done eventually, and with all the love and prayers coming your way, the chemo will do it’s job. Have a fabulous Christmas and a terrific New Year. Best wishes for you and your family this Christmas. I’m so glad you are responding well to your treatment and hope all goes well with it. You can beat this!! Thank you for sharing some of the details, your story is very inspiring and uplifting. Merry Christmas and Happy New Year! season and in the new year to come. Thank you for your good wishes, Mary, and I hope you have a lovely, peaceful Christmas. And thank you also for the update letter. I have been so lucky as no one in my family has had to go through this ( and hopefully they won’t!). May 2016 be a very good year for you and your family. And thank you for the personal update. Sounds like you’ve good healthcare providers on your side to help with the pesky side effects of the medications. Bless you, your family, and your doctors. Enjoy your holiday break, take care of yourself. We are all sending good thoughts and prayers your way. Best wishes to you too! It’s hard to take a break sometimes, but I’ve found that I’ve always come back more creative and more inspired than ever, so it is well worth it. It should almost be mandatory! Enjoy your break, your holiday, your family, and be well! Get Well soon Mary and have a wonderfull Christmas. Merry Christmas, and thanks for the Christmas update. One of the best things I learned from going through radiation/chemotherapy is that I could trust the doctors and nursers to do everything they could to make me comfortable. Don’t know why I’d doubted, but there you go. Love the little rabbits. Wouldn’t they look great stitched up? Merry Christmas to you Mary! Thank you for the update. I hope it all goes as easy as your first treatment, and I pray that it all goes away quickly. God bless you and your loved ones. Very best wishes for Christmas and for a happy, HEALTHY New Year. Thank you for all the joy you have given us during 2015 – may 2016 bring you joy in double measure. Dear Mary, Have a happy Christmas. Best of all good wishes. Wishing you a very Merry Christmas, and I’m glad you can spend it with your family and friends. I spent some time at KU Med last year fighting that nasty disease and am grateful to be doing well now. I hope your adventure goes as smoothly as possible and that you are soon back on your feet. Have a lovely Christmas with your family, Mary, and a happy – and much more healthy – New Year. Mary, All my love to you across the miles. May your Christmas be Merry and the Star guide you through this coming year. You are an inspiration to us all in SO many ways. Hello Mary…Iam so glad you were able to spend time with your Mom shopping and having a special time with her…I miss my Mom terribly but I have my Daughter now who is also my best friend…funny how things are when she was younger and not married we were always fussing with each other now we cant get enough time to chat…..anyways today my sister sent me a beautiful Xmas card and the front of the card has a picture of a Chickadee….well this little creature is my most favorite bird…I always look forward to seeing them in the winter….well Iam sure you have heard that most of us here in the N.East are having spring/summer weather and I haven’t seen one yet…I sure hope we get some cold weather before all is said and done. The reason I bring this up is I want to do an embroidery of a chickadee on a evergreen branch and some holly…so I checked my book that I have had for years Helen Stevens thinking I saw one in the book but nope she had others but not a Chickadee so Iam on a search for one…I did come across some on pinterest but most don’t have a pattern so I will continue to find one after the holidays…..and on that note…..
Trish Burr has a stylized chickadee pattern in her Etsy shop, and I think one of her needle painting books also had a chickadee. The Victoria Sampler has a great Chickadee design in their Folk Art Birds series. It’s designed by Cathy Jean and sits on a branch. Very folksy. Its pamphlet CJ02. Profitez bien de cette belle journée avec votre famille. Merry Christmas! You have a wonderful sense of humour. Thank you for the up-date. We greatly care about you and wish you well as soon as possible. Enjoy a very restful holiday. Blessings for you, Mary, everyday. So glad to hear that you are taking a few days off – a well deserved vacation! We all need space and time away from work – even work we love. I hope that your Christmas is full of joy and that you are surrounded by family and friends. As a member of your online family, I am sending my love and best wishes. Mary, I hope you know what an inspiration you are to all of your un-named fans. You’re endearing, thoughtful for taking the time to share your knowledge and just downright inspiring! Thank you for all you do for me (and all your readers and website passer-by-er’s)! I wish you and your family a blessed Christmas and a wonderful 2016! Thanks for the update Mary, just wanted to stop by and wish you Merry Christmas! Wishing you a very Merry Christmas and only the best for 2016! Thank you for your wonderful blog, and for giving so much beauty, cheer and encouragement to your many readers. Love and best wishes to you for health and joy in the New Year. A Merry Christmas to you and to your family. Have pacefull holidays with love from every one, and we are thinking of you. Take care. Merry Christmas, Mary. I hope you have a wonderful time with your family, and 2016 brings you good health and happiness. Thank you for all you do on Needle’n Thread. Mary enjoy your vacation we will miss you but will servive! Merry Christmas! Wishing you a very merry christmas! And all the best for 2016! Muchas gracias Mary por los buenos deseos para nuestra Navidad y año nuevo y por compartir tanto de lo que sabes hacer bordando! Que tus vacaciones sean las más reconfortantes y que te llenen de energía para que sigas comparttiendo tus habilidades con nosotras tus lectoras! Que Duis te regale mucha vida con salud y mucho de todo lo que desees para el 2016! Y saludos y abrazos desde México ! Merry Christmas from hot and sunny FL., Mary! I wish I had some of your snow, if just for today. Have a joy filled holiday, eat lots of Christmas goodies and gain a few extra pounds God bless you and keep you! Wishing you a blessed new year – every day of it! All the very best Mary, I hope things continue to go well and that the chemo does its job. Merry Christmas, Mary. I’m glad to hear you are doing so well. Please keep us posted. Thanks! Merry Christmas Mary! Thank you for the updates and all you have done for us over the years. Hope you get some much deserved quiet time with your family. Prayers continue from here. God bless you and all those you love. 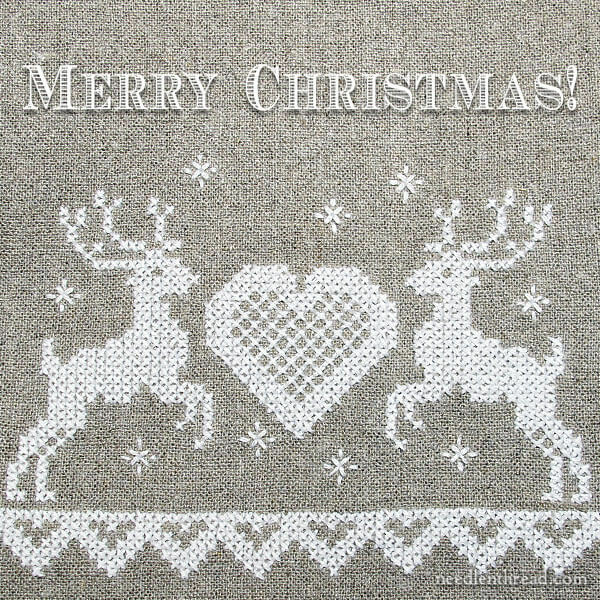 I wish you a Merry Christmas and only the best for 2016 .you and your site for always being here for us to share your arts and thoughts and all your stitchers….I have learned so much from you many year . Thanks for the update, glad the timing worked for the holidays. Have A Great New Year! Lovely to read the update about yr health and enjoy this much deserved break. Thanks, Mary, for another year of inspiration and knowledge. Very best wishes for a Happy New Year to you and all the other wonderful, interesting members of the Needel’n’Thread community. Previous Previous post: Tutorial for Stitching on Soluble Canvas & Free Patterns! Next Next post: Happy New Year – Backwards and Forwards!